I so like reading Erica's series! She knows how to keep you reading your book. She pulls you into the story and you can't get out. Dahlia has an orphan Home to teach children how to work to get a job. She hears a girl scream and jumps in to save her. A stranger, Simon, runs after the man while she takes the girl to her Home. That is how Simon, of the Watch Tower, meets her. Dahlia has troubles like how to feed 24 girls, keep them safe and clothed. She has decided on a way to get donations. It is a Major Spoiler! It is different. Simon is a true detective who follows the rules. Simon finds the trouble and Dahlia doesn't like it. While this is going on, Simon is trying to talk to his half brother , Lord Hawkridge, from his late father. Their father made them jealous of each other. Major Spoiler! This is a bit adult read and other places to save the Home. I recommend to read this book and other books If you haven't read others. You won't regret it! I volunteered to read and review this book. Lord of the Night is like a beautiful quilt. There is mystery, romance, humour and pathos. Dahlia Grenville has an unusual approach to solving the problem of keeping her school for impoverished girls in the seedier side of London operational. When Lord of Night, the taciturn Bow Street runner Simon Spaulding comes to her rescue, the attraction between them is immediate. Unfortunately when it comes to the law, Dahlia and Simon are at opposite ends of the spectrum. At times the story is light hearted and full of humour, but there is also an underlying sadness as the underbelly of life in Regency times is exposed. I loved Simon's character and although Dahlia's choices are not acceptable, she is nevertheless a delightful character, full of love and passion for what she does. This book forms part of a series and is a standalone, although characters from previous books also appear. The story is well written with a good flow of language, making it an enjoyable read. I received a copy of this book as a gift and this is my honest and voluntary review. Protecting, nurturing and instructing flow easily from Dahlia to her students. Obeying the laws which benefits all is Simon's belief as a bow street investigator. Feeling develop between them. Each showing the other the way to fuller and richer lives. Lively, spirited historical romance with a few twists. Enjoyable from beginning to end! 4 1/2 stars. Voluntarily read ARC for honest review. 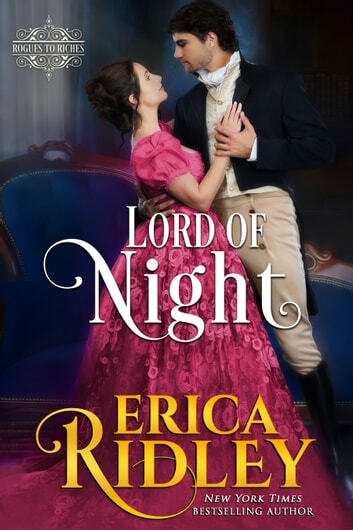 'Lord of Night' by Erica Ridley is book Three in the "Rogues to Riches" series. This is the story of Dahlia Grenville and Simon Spaulding. I have read the other books in this series but feel this is easily a standalone book. Simon is an Inspector with the Bow Street Runners. Simon's fellow workers call him a "Lone Wolf" Simon likes being thorough in his duties and feels he is wed to his job as his other friends are wed to their wives. Simon feels the unjust in some of the poor areas were there are no Watchman, or the Watchman doesn't stay on his post. Dahlia is the second daughter of a good family but has taken on the task of starting a school for young girls who are in trouble. Dahlia is the headmistress also. With so many girls to save it doesn't take long for her school to fill up. One night while while finishing up she hears yet another girl in need. Dahlia goes to that girls rescue because she knows no one else will. There are not Watchman in the area and lots of time they won't help if they were. But on this night when she gets the girl free and with the bad guy chasing them...someone does show up....Simon. Simon returns to the school to let Dahlia know he caught the man. Simon is taken back by the mystery that is Dahlia...not to mention his attraction to her. Dahlia too is surprised that Simon even return much less that she finds him interesting. Simon tries to stick to his lone ways but he can't fight the feelings he is growing for Dahlia . But Dahlia has allot going on and doing questionable things to keep her school going. This was a joy to read and I can't wait for the next book by Ms. Ridley. "My honest review is for a special copy I voluntarily read."